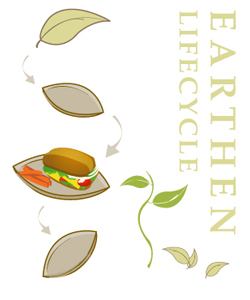 Fallen leaves prove to be a naturally Renewable Raw material. No trees are cut or harmed in the making of this dinnerware. This dinnerware is naturally biodegradable just like any other leaf fallen from a tree. The dinnerware is 100% natural and chemical-free. No glue, dye, or polish used. Sterilized by heat and water. Can be disposed in compost along with kitchen/yard waste. Produces rich compost and when further used, returns nutrients to the soil. Approved by Victoria Compost Education Centre. All our packaging is Oxo-biodegradable making this a zero-waste product.